Multi-Mount for Attaching 3 iPhones & Smartphones with 1/4-20 Thread Camera Tripod Ballhead : allputer.com - Accessories for all your Portable Electronics & Computers! This Multi-Mount includes 3 smartphone holder that allows you to rest upto 3 smartphones on a camera tripod for broadcasting / live. What you need to have the ball head on the tripod, have this multi-mount on the ball head then mount up to 3 smartphones, then you can have your live videos on many social medias. This is a must for youtubers, vBloggers. - Holds upto 3 smartphones at the same time for live stream. - This 3-Smartphone tripod mount includes 3 universal smartphone holders so you can stream or record video in 2 directions at the same time. - Allows to view the screen in Portrait or Landscape. - Includes 3 spring loaded Phone Clamps so you can easily attach your phone and view the screen. These clamps provide a secure hold on your phones so they will stay in place. 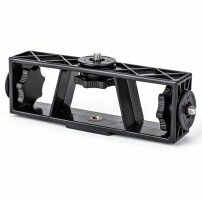 - Works as a multi hot shoe mount, you can mount smartphone on, LED Flashlight on or even a microphone (need to use with the the 1/4-20 thread).